Adjustable integrates the strength of steel with the beauty of select hardwoods and custom moldings to provide innovative and economical alternatives to custom millwork storage. With an endless list of functional accessories and custom sizes, Adjustable's wood clad shelving can be specified to meet today's requirements - but unlike custom millwork, can be easily reconfigured to meet tomorrow's inevitable changes. LF1000 Shelving with mahogany end panels and custom tops provide innovative CD storage with the beauty of custom millwork at a fraction of the cost. 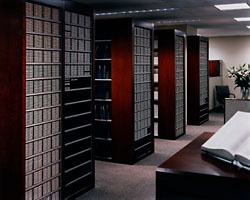 The versatility, strength and economy of steel shelving can also be combined with laminate. By utilizing doors, drawer fronts, end panels, and our endless list of accessories, Adjustable offers the custom "built-in" look of custom laminate millwork at a fraction of the cost. 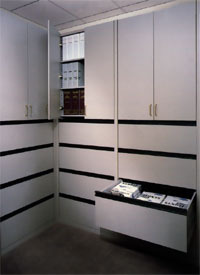 Shelving and storage modules can be specified wall-mounted above counters or floor-standing, in any size to fit existing spaces. 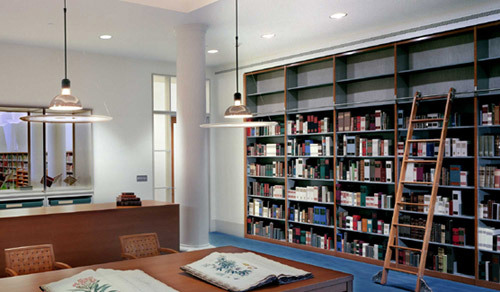 LF1000 Shelving with laminate doors and drawers effectively replaces expensive millwork with the added strength and versatility of steel shelving.